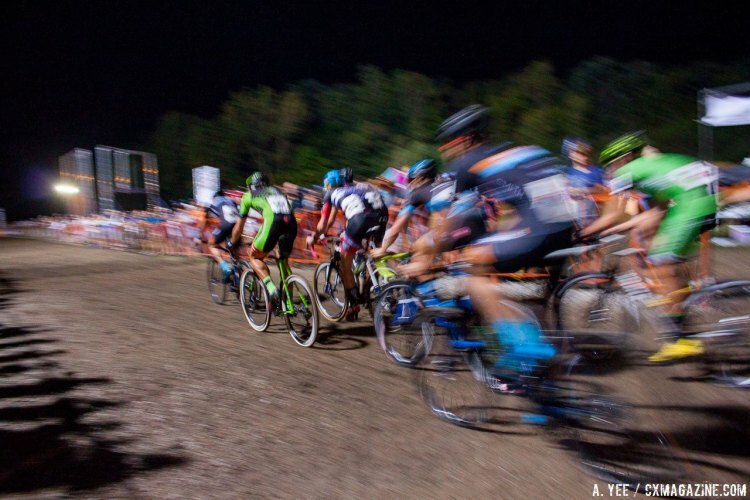 The 2016 Jingle Cross weekend offers three levels of UCI racing for Elite cyclocross racers, with Friday night’s C2 event, the World Cup on Saturday (watch live here) and a C1 on Sunday. 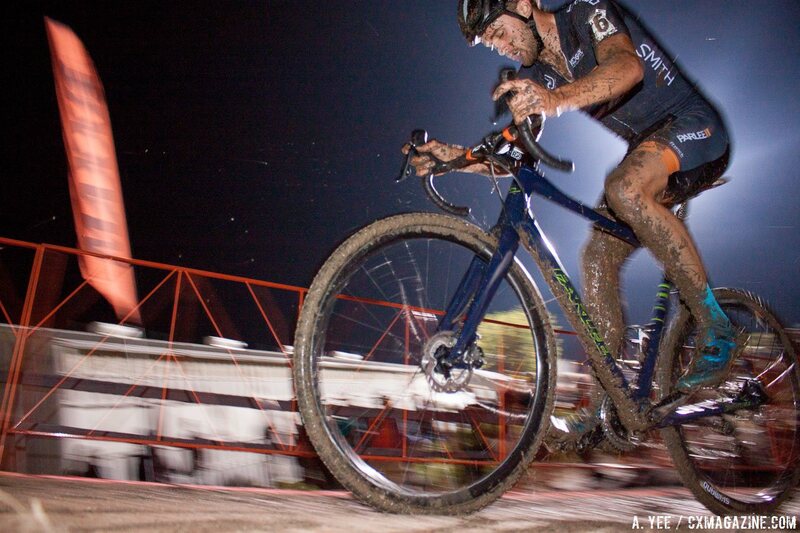 The question was, who would race on Friday, and risk using up energy, or crashing, before Saturday’s World Cup? 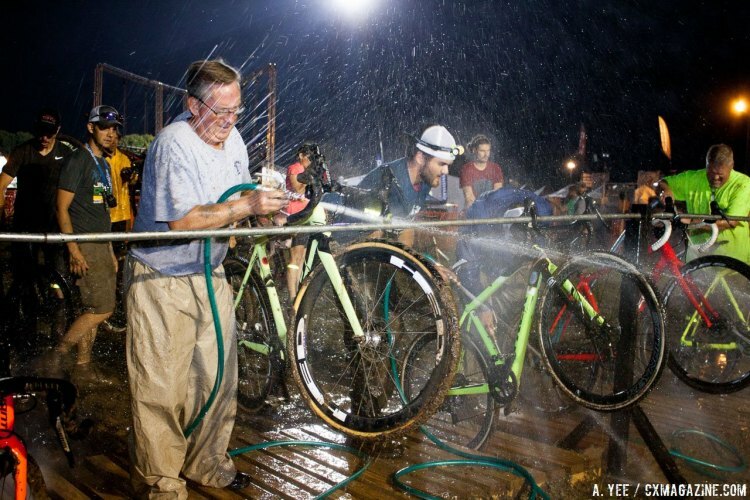 However, a quick glance at the start list or results reveals that most of America’s top racers, including Jeremy Powers, Stephen Hyde, and Jamey Driscoll, opted to stay clean, dry and rested heading into the second U.S. World Cup. In the men’s race, Curtis White (Cannondale p/b CyclocrossWorld), teammates Danny Summerhill and Travis Livermon (Maxxis Shimano) and the ageless Jonathan Page (Fuji) all took to the start despite the heavy conditions. “I didn’t want to be here and be in my room wishing ‘hey why aren’t I racing tonight.’ So I’m glad that Travis and I obviously raced and just got a feel for mud again. I haven’t raced mud in a long time” -Summerhill on his decision to race Friday’s UCI C2 event. 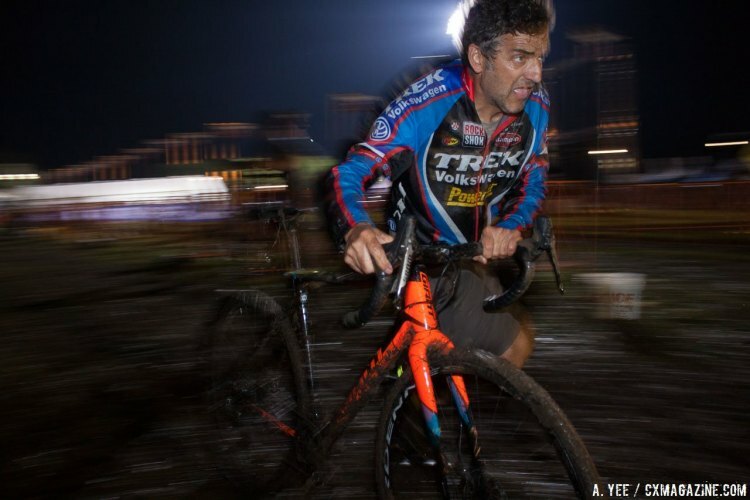 At 40 years old, some might think Page would value recovery time after racing CrossVegas and before Saturday’s World Cup, but the upside of competing on Friday was a good chance of landing in the UCI points, as he did in 2015. 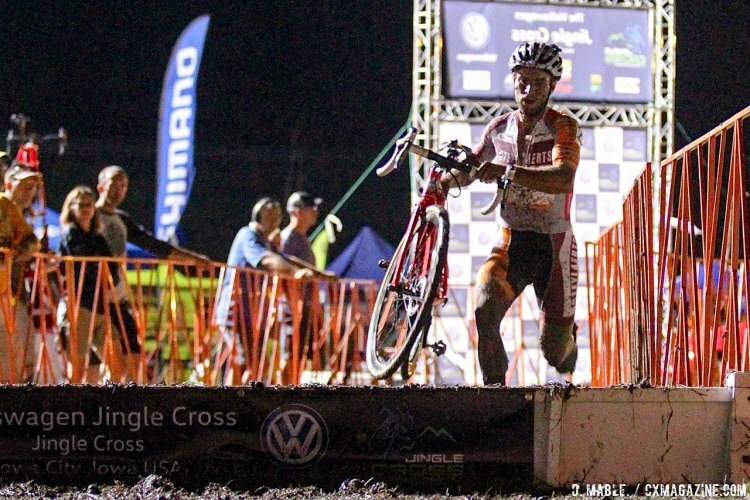 Of course, a bit of prize money never hurt for motivation for any racer not expecting to contest for overall World Cup placings, but most European racers stayed indoors on Friday night, with just ninth-placed Antonin Marcecaille from France being the other European race to take the start. 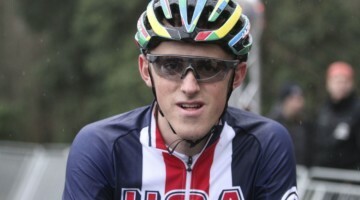 All but three of the 41-rider field were from North America. 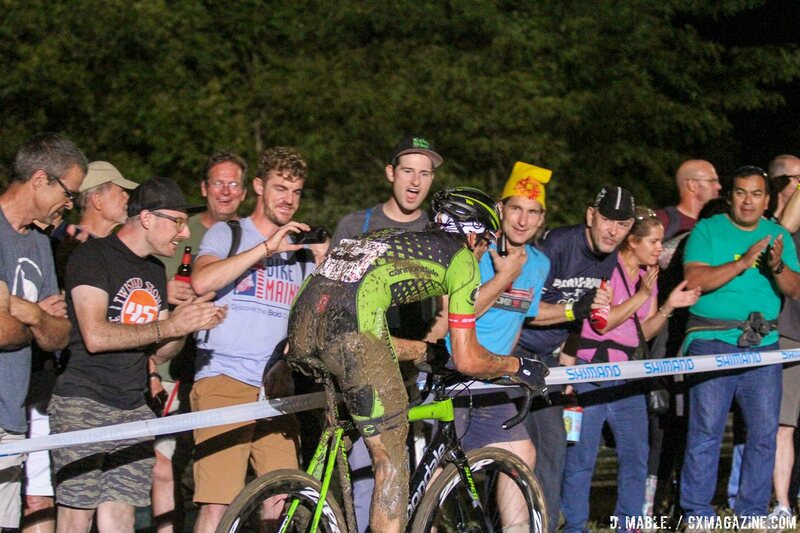 All four Americans’ decision and risk taking paid off, as all landed in the top five, but on Friday night, they were upstaged by a similarly-risk-taking German in Marcel Meisen (Steylaerts-Verona). Meisen is no stranger to top-level cyclocross, racing World Cups, winning the German National Championship, finishing ninth overall in the Superprestige series in 2013 and (perhaps his least-known claim to fame) was the most consistent racer of the entire men’s field in Tabor at the 2015 Cyclocross World Championships. 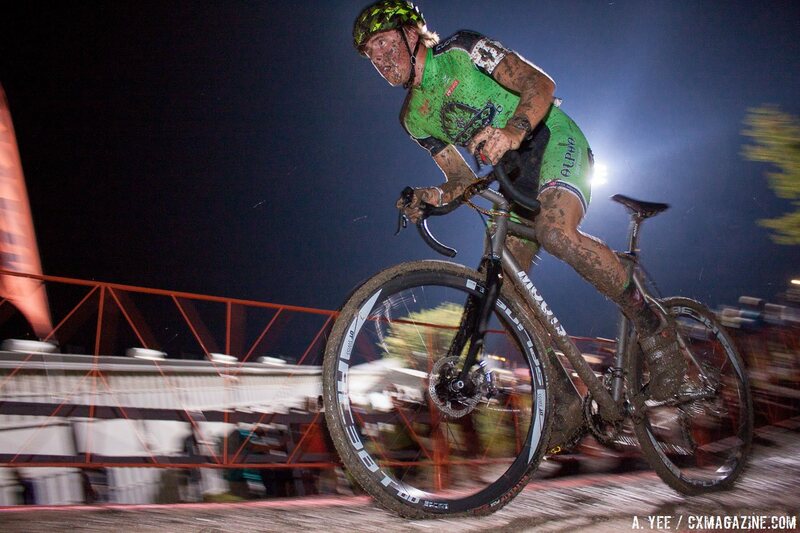 Meisen, unlike the Americans giving chase, did not race CrossVegas, and made the trip from Germany just for the Jingle Cross event. The German wanted to get his money’s worth, and it showed early on in the race. The German pressed forward up Mt. 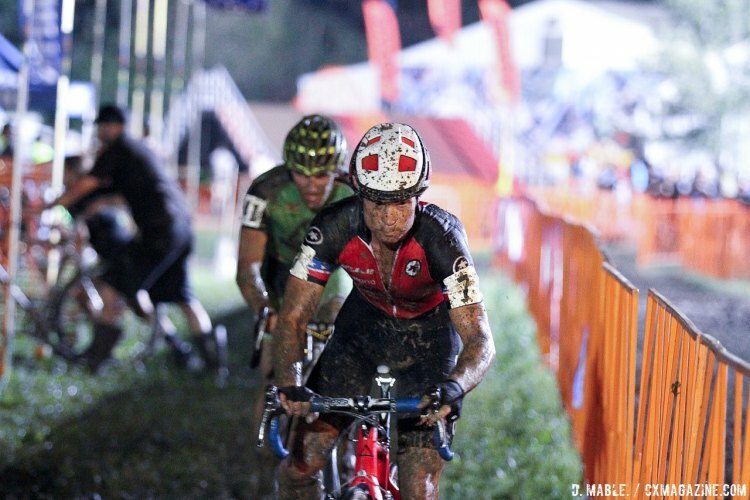 Krumpit and through the heavy, muddy course, putting 30 seconds into most of his competitors with only White, Summerhill and 2016 Junior National Champion Gage Hecht keeping him within sight. Just one lap down, Page and Livermon were a whopping 34 seconds in arrears. 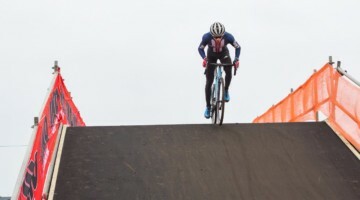 On lap two, Meisen, warmed up from his first lap effort, put on an impressive display to distance the rest, and in the process set the fastest lap of the day and showed everyone his Iowa City trip was serious business. It quickly became a race for second. Behind, White and Summerhill were locked into a battle for the silver medal, while Hecht would slowly fade. Summerhill put together some impressive lap times, passing White on the fourth of seven laps, looked to have second locked up until White found his second win with two to go and reconnect. The race was also an opportunity for non-World Cup racers like Gage Hecht (Alpha Bicycle / Vista Subaru) to strut his stuff. The first-year U23 racer showed his maturation, with a fast start and consistent race until the last lap, when the young racer would be passed by Yannick Eckmann (Boulder Cycle Sport/Yogaglo) and Livermon. In the pits, the competition for power washers was fierce as well. Many racers were pitting every half lap, making for repeated sprint workouts for the pit crew. Was there anybody on cantis?